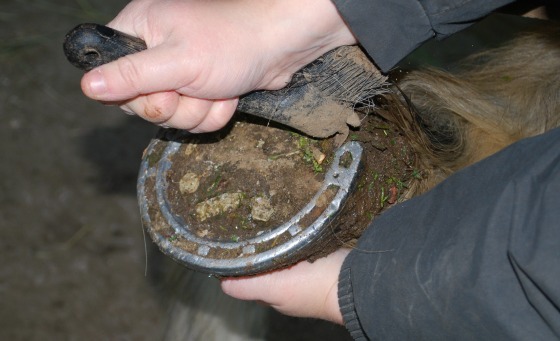 Picking out a horse’s feet is essential for foot hygiene and will also help to prevent lameness injuries. Get your horse to pick it’s feet up. Mine are pretty well trained and I just say ‘pick up’ and they pick up the foot where I’m standing. You need to be facing the horses back end at the side of the foot you’d like to pick up. Run your hand, the one nearest the horse, down his leg to the bottom – usually they will pick it up for you. Use your hoof pick to pick out the dirt, stones etc. 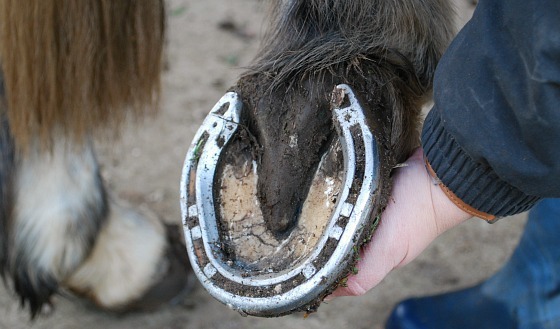 Be very careful not to stick your hoof pick into the horse’s frog – that’s the fleshy V shaped bit in the centre of the hoof. I go from the groove next to the frog to the outer edge of the frog. Some hoof picks, like mine above, also have brushes on them that you can use to help get rid of the dirt or alternatively brush off mud from the hooves outer wall.